Model T Ford Forum: Painting Wood Wheels? 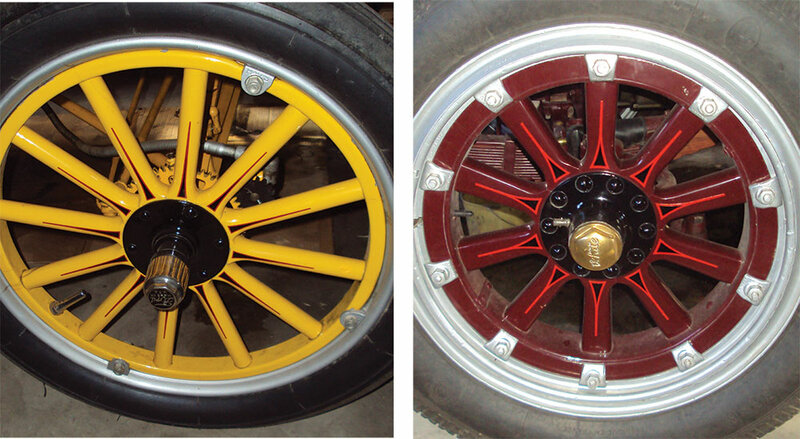 Model T Ford Forum: Forum 2014: Painting Wood Wheels? 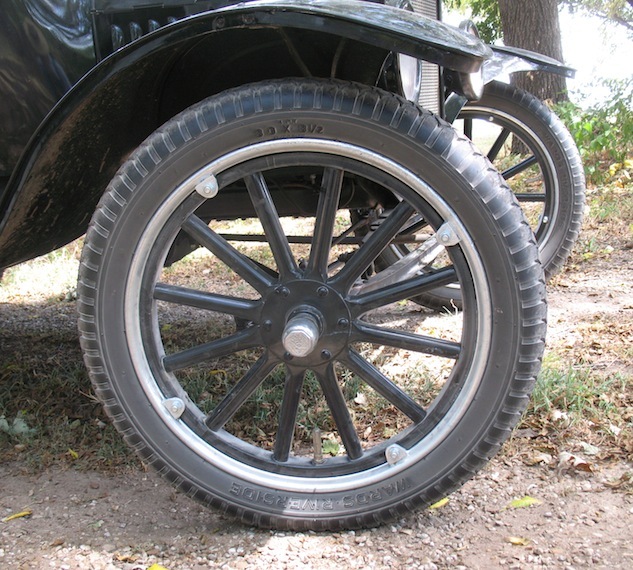 Our local wheelwright is just about finished with a new set of wheels for my mostly 1923 Runabout that I have been calling "My Problem Child," While I'm overjoyed to hear that the wheels will soon be ready to go, I ran across another setback. I've tried to find a painter and have, so far, met with failure. The fellows I have contacted say they can ONLY paint with government approved two part (base/clear) paint that would not look very good on a Model T and they didn't care to try it in any case. What sort of paint works in this application? Does anybody know of someone who does a good job in the north Orange County CA area? You can easily do the job yourself, and in that case, you can use what you want as long as you can get it. Don't be afraid to try. Here is my method. You may need to modify it based on your individual circumstances. I pre-paint the rims and hubs before re-spoking, which gives added protection from moisture creeping under the felloe. Begin by removing all dust with a good tack cloth. Use a good quality outdoor wood primer. I like and use Kover Stain, sold at Home Depot stores. Thinning the material about 10% with Penetrol paint conditioner makes it flow on a lot easier, which will save sanding. Using a good quality 1-�� china bristle brush, apply one good coat. Let dry about an hour, sand lightly but thoroughly with 150 grit sandpaper and brush on a second coat. Let dry overnight. Sand thoroughly (this doesn't mean heavy pressure on the paper, just get all areas) again with 220 grit paper. When all the wood is velvet smooth, mount the tires. Inflate to 25 lbs or so and mask off completely in preparation for spraying on the sealer. In order to spray an even coat and prevent runs, mounting the wheels on an easily rotated spindle of some sort is critical. I used a 30� length of 2 x 10 and mounted 2 pillow bearing blocks on it to support a 1� shaft, 36� long. Chuck the shaft in a lathe and drill and tap the end for a �� bolt. Remove the bolt from the end of an old wheel puller, the type that threads onto the hub, and bolt it to the end of the shaft with the �� bolt. Slip the shaft into place in the bearings, leaving 6� of shaft with the wheel puller overhanging the board, and run in the bearings� set screws. Mount the whole works to the top of a wooden sawhorse with some 3� decking screws and you�re in business. Some guys simply string a section of pipe between two supports and hang the wheel on it. This works, but the smooth action of the shaft and bearings when rotating ensures a smooth finish. Thread the hub of one wheel into the wheel puller and run it up snugly. You may need to put a counterweight on the opposite side of the sawhorse to keep it stable. I use a sleeve of tube sand. Plug the bearing hole with a rag or a wood or plastic plug. Spray a good coat of a sealer that is compatible with your topcoat. Begin at the crotches between the spokes, then the hub and move outward from there, ending on the felloe. Let dry, then inspect closely and scuff off any nibs. Do all the wheels and then topcoat in exactly the same way that you shot the sealer. 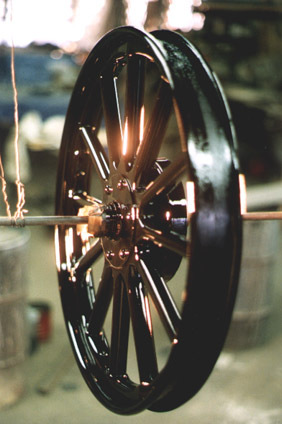 When finished, rotate the wheel slowly by hand as it dries and the wheel will be run-free, guaranteed. Nothing sets off the car like the wheels, and you love being able to say that you did them yourself. Ace rattle can appliance epoxy enamel on these wheels still is OK after seven years. The greatest number of comments and "Wow's" I get on my car have to do with the spokes, which are simply finished with a light stain and varnish. There seems to be something about the contrast between a totally black car and wood-colored spokes. My side in the spokes controversy believes they should be black the way God and Henry intended. I have seen some of the spoking jobs that I believe are done by the wheelwright that Paul mentioned. I would stay away from him. Calimers for me, but I like perfection. I want them to be Henry Ford black, just as they would have been when new. I'm not looking for comments as I don't do shows or parades. I wanna drive this car! I have had poor experience with gloss black spray bombs. First, the overspray defeats the gloss leaving a patchy look that I do not care to have on my new wheels. Second, I have doubts that the current PC paint will last. I do a lot with spray bombs on various projects but always on parts that are protected from the weather. Steve, I have not thought of appliance epoxy. Is it easy to use? How about the overspray issues? I like the way it looks on your car. Not difficult at all. I try to get each coat all on and wet at the same time for an even finish. I cheated by painting all the pieces before assembling the wheels. From the video clips I can recall, Model T wheels were hand-sanded, then dipped in paint and then spun to centrifugally remove the excess. -I don't think Mr. Ford was all that concerned about chasing down a few drips. -Simple, cheap and adequate. During the Brass-Era most brands of cars had painted wheels and the more expensive examples had some pinstripes applied on top of that. -Natural wood-grain under clear coats of varnish or linseed oil appeared a bit later in the game, as recently documented by Roger Karlsson, who pointed out where the online Model T encyclopedia specifies that natural wood spoke wheels became available in 1925. We know that when Model T Fords came back to dealerships for major repair, they received whatever updated parts would fit (entire rear axle assemblies, for instance) and Ford was not at all concerned with such frivolities as originality. -An updated car was a better car. -That being the case, I wonder what span of time might be considered "period-correct" for an individual car and whether dealer-installed, updated parts (as perhaps documented by dealer paperwork) might be considered a legitimate part of the car's historicity. - With that in mind, might purists of a slightly more liberal bent see natural-wood spokes as being acceptable on an earlier car? Just depends on what you want. AACA wants it like it left the factory, so even dealer installed options are a no-no. Local hot-rod dominated car shows might put it in the same class as a T-Bucket. So like I say, just depends on what you want. My standard is pretty simple. I imagine that I have a time machine and could take my car back to a time two to three years after it was built and park it at the curb of an American town. I want to build a car that would not be noticed by passers-by. I want a car that would look typical of the era. Ordinary. Average. Not exceptional in any way. 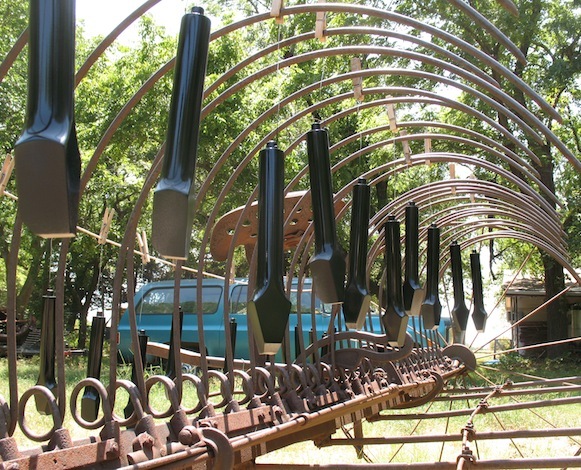 Paint & plating can be a bit used looking. Accessories should also fit into that pattern. Vintage Paul, would be time traveller . . . I like that standard Paul. I have always brush painted my spokes with a slow drying enamel over Varathane or similar wood coating. I use a soft 1" brush. The maroon wheel shown was painted in 1982. Enamel doesn't dry hard and stands up well. Tractor enamel or Rustoleum is similar to the Dulux I used to use. I don't know if finding nitrocellulose lacquer paint is an issue for some of you restorers. A few years back I sprayed a lot of nitrocellulose lacquer on several custom guitars. Stewart MacDonald Luthier Supply still sells nitrocellulose lacquer. It's spendy but fun stuff to work with. Nitrocellulose is great stuff to work but does not do well on wheels. Wood and steel spokes flex enough to crack paints that dry that hard. Also it doesn't do well in climates that have a lot of daily temperature fluctuation. Lots of cracks. restoration of cars. The simplicity of the T and an appropriate expectation of period finish is SO appealing ! vehicle in "close enough" condition/finish. warp glimpse at the Americana I saw slipping away to the horizon when I was a kid. Paul, if U can't find the paint you want, consider heading to the HD in Reno. Nevada has different rules. Richard, do you thin out the paint to help it flow out a bit to minimize brush strokes? I find your method appealing as mounting and dismounting tires eventually does damage paint no matter how carefull one is. I would think one could also sand back brush strokes and buff the wheel up real nice! And it could be done often and without any equipment. Also appealing because this is how nice finnishes were done before the advent of spray application. I don't thin the paint. The soft brush minimizes the brush strokes and the slow drying enamels flow out quite well. I do one side of a spoke and the flip the wheel over and do the other side and a second spoke. Also the felloe between them. After all the spokes are done I do the hub and the rim, one side and then the other. Cooler weather helps rather than a hot afternoon. If you have a wheel to practice on you can develop the technique. The wheels shown have no brush marks but the wood grain shows up in a few years. That's OK with ms as a lot of folks can't believe they are wooden spokes. There's an advantage if demountables that hadn't occurred to me. Mounting tires on the galvanized rims you don't have to worry about scratching the paint, because there isn't any. Thank you, very cool and heplfull! I know keeping the grain from coming through is tough, but I dont worry about that. I should add that with the Varathane and Enamel process I do two coats of enamel or if the spokes are rough, 3 or 4. I also let each coat dry a day or longer in between and lightly wet sand to smooth it out some. If you mount the demountables from the backside you don't see much mounting damage. The wood grain is very subtle and not too objectionable. Glad you brought this up Paul and David and have fun with it. David..to keep grain from coming through I took Joe Bell's advice and got a kit of "Kwik-Poly" from Langs. Goes on thin as water, sets up SUPER FAST, requires minimal sanding, and then the spokes paint up so nice and smooth you'd think they were metal. I top coated with PPG DAR 9000 gloss black acrylic enamel, thinned with reducer and a hardener, and they came out super. Two coats. Would've been even more super with a third, but I got lazy! Just a thought. I know that some folks fill and sand, and fill and sand, to get rid of the wood grain on the spokes. I don't do that, because I like seeing the grain. And I like seeing the looks on people's faces when they look closely and realize the spokes are wood. Wood-grained spokes are good conversation starters. I have used some excellent grain fillers for solid body guitar refinishing but I would not bother on a wheel, well at least not go crazy over it. The reason is that the wheel gets so much flex and humidity fluctuation that it will show eventually. My old Fender precision sits in a case under the bed. I just like a finish on a wheel that will be nice and shinny, holds up ok, and easily repaired and repainted. Many different methods. I like the one Richard mentioned, and will try it. I also agree Mike. I like the grain showing. I can have the look of wood while staying Ford black. People ask if the spokes are wood and before I can answer, they say "oh yes they are". I'm with Mike too. Do you believe Ford, or anyone else sanded the spokes so you couldn't see the grain, I doubt it. 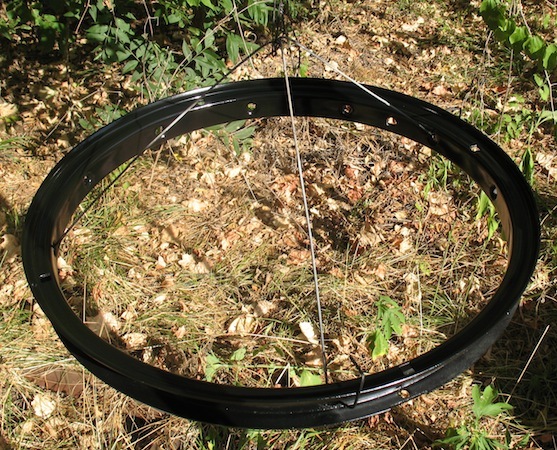 I just paint my wheels with a piece of pipe clamped to a saw horse, and spin them by hand as I paint using the inside of the rim or felloe where no one is ever going to see. They always come out good. Ford was interested in getting the cars off the assembly line and that was the bottom line. I believe one of the early photos of the Ford assembly line shows the wheels being assembled, and one fellow is using a strip of sandpaper to smooth the spokes--not saying how smooth he's getting them though! My restored wheels don't look like wood---oh well. . .
Wood grain .... hmmmm .... If I wanted a plastic-smooth vehicle, I'd get a KIA or a Honda. I thought the whole idea behind a wood-wheel-era car was the organic nature of it ??? Not to worry; my unrestored wheels have lots of grain & Patina--those (in the picture), though had to be restored. I was one of the ones that could not force myself to paint those beautiful new wood wheels. It's surprising how many people look at them and remark about them being wood. I often wonder if the same people would also think that if they were painted black? I would say not Gene. When I originally bought my T the wheels were black and nobody ever commented on them. Now I have a set of borrowed natural wood wheels and hear words of astonishment every time the car is out in public. I often wonder what they think wagon or buggy wheels were made of . . . I do like the idea of brush painting the wheels. If I had a really good slow drying enamel it might be worth a try. This is the right time of year for painting.